A number of things can make your stress levels rise during a move. Being a victim of a burglary is probably one of the worst things that can go wrong. Of the 1.4 million yearly burglaries, the majority of the homes aren’t in the middle of a move, but it happens. Based on how burglars target homes, here are a few tips for making sure you don’t get singled out during a move. There are a lot of to-dos in regards to your home systems when you’re gearing up for a move. Some people get accounts transferred or shut off as soon as possible so there’s one less thing to worry about. But one account you want to leave up and running until you’re completely moved out is your home security plan. Even if your social media accounts are private, word can get around about your moving plans if you post information on your social media accounts. Friends of friends that you don’t know that well may see it as an opportunity to nab things while you’re in between homes. The safest bet is to wait until you’re moved to announce you’re in a new home. Burglars specifically target homes that they believe are vacant. Leaving behind a few items in your old place that you plan to pick up in a day or two might not be there when you get back. The same goes at your new house. Moving some of your stuff before officially living there could increase the odds of being burglarized. It’s best to get everything moved at the same time if possible. You also don’t want your new place sitting vacant for too long, even if you haven’t move in yet. Some burglars aren’t just out for your possessions. They’ll steal just about anything they can get their hands on including window treatments, lighting fixtures, appliances and copper pipes. That’s right, people will steal copper pipes out of a vacant home. When you create your packing plan leave the curtains or blinds until last. Burglars often scope out homes before they decide to break in. They’re looking for homes where there’s something good (a.k.a. valuable) to steal. You’re less likely to be a target if burglars can’t see in through windows to find out what’s inside. When you hire a moving company you’re sharing a lot of personal information and giving them insider info in terms of your living arrangement. Getting a few cheap hired hands off of Craigslist may sound like it will save you money – until you realize they used the information to target your home(s) during the move. And it may not be the movers doing the stealing. 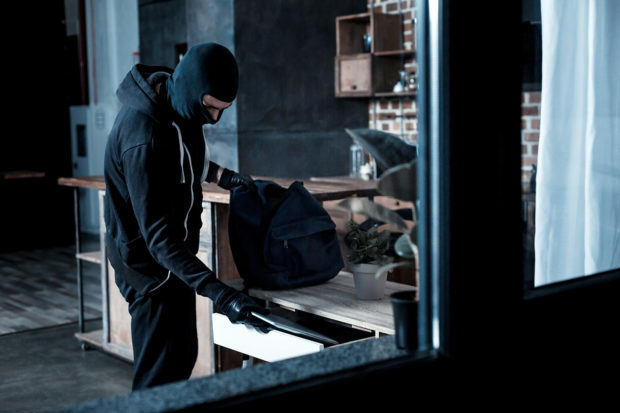 The University of North Carolina study also found that a third of burglars gather insider intel before breaking into a home. Often this information comes from hired help that’s been inside the house or know the movements of the people who live there. Square Cow Movers is a legitimate, licensed moving company that always keeps client information confidential. We offer moving and packing services that can help you get moved in a single day so there’s less concern over things being left behind in a vacant home. Give us a call to start planning your move with a professional moving coordinator.